Hawick and Denholm councillor Clair Ramage with Billy O'Neill, a lollipop man at the town's Wilton Primary School. Cash-strapped Scottish Borders Council’s plans to save £80,000 by making cuts to school warden patrols and other services could put children’s lives at risk, it has been warned. The Conservative-led administration has announced that a review of both the patrols and council janitorial services is to be carried out to assess the potential for efficiency savings. A council spokesperson insisted that no decisions will be taken until consultation has been carried out with parents, headteachers and pupils, though. The Southern Reporter understands there would be cross-party resistance to any rationalisation of the service resulting in a reduction of the number of school patrol wardens on our streets. The move has alarmed former teacher Clair Ramage, now a Hawick and Denholm councillor, and she raised her concerns at the last full council meeting. 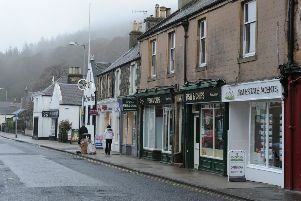 She fears any such move could put at risk the safety of the region’s schoolchildren, and she also worries that the review is already having an effect after discovering that the lunchtime patrol at Hawick’s Wilton Primary School has been withdrawn. Ms Ramage said: “For me, it is not good enough as the safety of our children should be a priority. She has pressed the administration for details of which patrols could be cut and what potential implications there are for lollipop men and women’s jobs. “Schools across the Borders have been recognised for their work to encourage parents to ditch the car and actively travel to work. Surely, removing crossing patrols flies in the face of this very successful initiative,” she added. East Berwickshire councillor Carol Hamilton, the council’s executive member for children and young people, responded by saying that any efficiencies would not necessarily result in jobs being lost. She said: “The review will look at the service as a whole rather than targeting any individual site. “A key element of the service review, which is in its infancy and information-gathering stage, will be to identify and implement efficiencies without necessarily incurring job losses. A council spokesperson added: “A review of the school crossing patrol service will be taking place, but no decisions have yet been made. Also concerned at the potential move is Hawick and Hermitage councillor Davie Paterson.